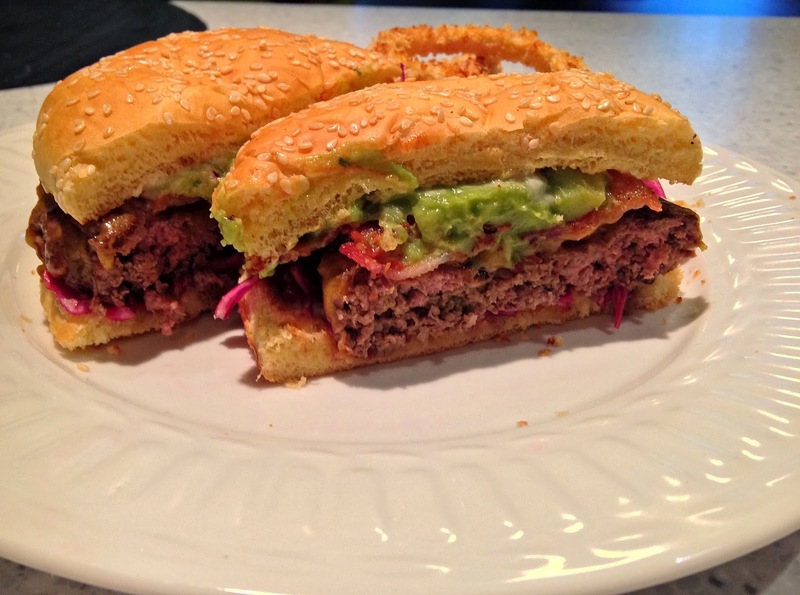 Usually a green-chile burger relies on external ingredients to impart the chile flavor. It's smothered in green-chile sauce or features strips of the roasted chiles as a topping. These are both tasty options. However, I think the best burgers are those in which the patty itself is the wow factor. Spice House's fantastic (really, it is) New Mexican Green Chile Powder allows me to create that better burger...a flavor-punching, family-pleasing, upscaled green-chile burger that you'll make over and over again. By all means, add a layer of roasted green chiles as a topping along with the cheese, purple cabbage and bacon, but it's not strictly necessary. The spiced, doctored-up patty can stand on its own. Combine all the patty ingredients in a large bowl and mix together with your hands or a rubber spatula. Take care not to over-handle the meat, but mix only enough to spread the flavors evenly. Shape into 6 patties. Meanwhile, fry off your bacon until crispy, and blanch your cabbage. Do the latter by pouring boiling water over the cabbage and allowing it to sit for 5-10 minutes, then thoroughly draining. This softens and mutes the cabbage just enough so it doesn't overwhelm the meat, while leaving behind a bit of crunch. When your grill is heated to medium high, cook the burgers only 2-3 minutes per side before moving them to indirect heat (as in the grill shelf above the main grate). Top with cheese, and allow to melt about 2 minutes - which is enough time to toast your buns, if you choose. To serve, add the following to the hamburger bun in order: a spread of mayonnaise, a thin layer of cabbage, the cooked patty, a strip of bacon (cut in half for two pieces) and a spread of guacamole on the top of the bun.